What it’s about: Ichabod Crane is a superstitious schoolmaster competing with Abraham “Brom Bones” Van Brunt, who enjoys playing pranks on him, for the young and lovely Katrina Van Tassel. One one autumn night, Crane is pursued by the Headless Horseman of legend, who is supposedly a ghost from the Revolutionary War. Afterwards, Ichabod Crane disappears, leaving Katrina stuck with the boneheaded Brom, and the mystery of the Headless Horseman unsolved. 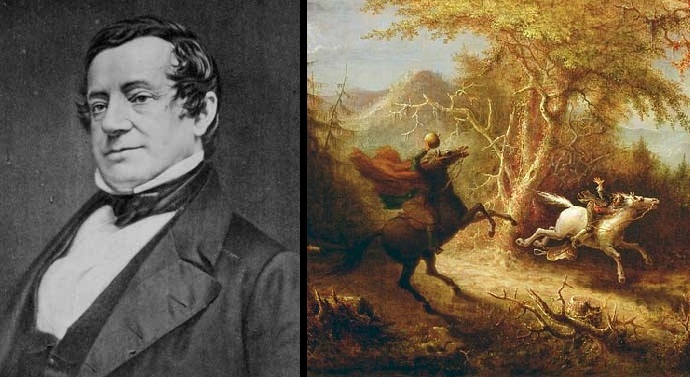 Why it will keep you up at night: The image of the Headless Horseman has stuck around so long for a reason: the idea of getting chased by a decapitated man on horseback is creepy and sinister. While the story may not have the same horrific bite and immediacy that today’s readers expect, it instead pursues a slow build-up of character and setting. Through Irving’s beautiful descriptions, we get a good sense of who Ichabod is, the dreamy and ghost-like nature of Sleepy Hollow, and a distinctly festive feeling of fall. And if you’re looking for more Halloween-oriented reading material, why not check out Zombos’ Closet of Horror’s interview with me about my favorite holiday? Read The Legend of Sleepy Hollow now!